Let’s build a Nintex workflow that integrates with SalesForce.com! Now that everyone has become acquainted with the new SFDC Connector for Nintex workflow we can discuss what you need to actually start building workflows that can tie it all together. Keep in mind, the initial SFDC Connector actions revolve around CRUD operations with SFDC’s CRM and Social (Chatter) platform. That said, I won’t get into how you could leverage each individual action. Instead, I will give you some tips on what you’ll need to get started down the path of being a SFDC / Nintex integration guru by pointing you in the direction of some must have resources and then walking through how to create a basic workflow that will capture a individuals contact details (generated on an iPad via the Nintex Mobile App at a SharePoint event perhaps! ), store it in a SharePoint list and then have Nintex Workflow create a Lead that your sales team can nurture into a sale using their favorite CRM, SalesForce.com. Now, as my favorite PBS artist, Bob Ross, would say, let’s get crazy. A SalesForce.com developer account – Since it’s not a good idea to experiment within your organizations production SFDC environment I would highly recommend signing up for a free dev account (by clicking here!) so that you can test the SFDC Connector without the fear of causing any issues with your live data. As this developer instance will be empty you may want to bring some records over to perform a more detailed test but that won’t be necessary at this point. The Salesforce Field Reference Guide – This document describes all of the SFDC objects and each of their corresponding fields. Click here to get it! This is very important as you will need to know which fields to map SharePoint columns to inside of SFDC. An Office 365 tenant with a site that has the Nintex Workflow for Office 365 app added to it. If you haven’t done this, log into your O365 tenant, click on the cog and Add an App, visit the SharePoint Store, search for Nintex and Add the Nintex Workflow app and trust it. Add the SalesForce.com Connector trial to the Nintex Workflow designer via the store. If you’re not sure how to do this, click here to watch a quick video made by my favorite Nintex Expert, Vadim Tabakman, that walks you through the process. Now let’s open the Nintex Workflow designer. Inside of the designer we’re going to place two actions on the canvas; Salesforce create record and Update item. 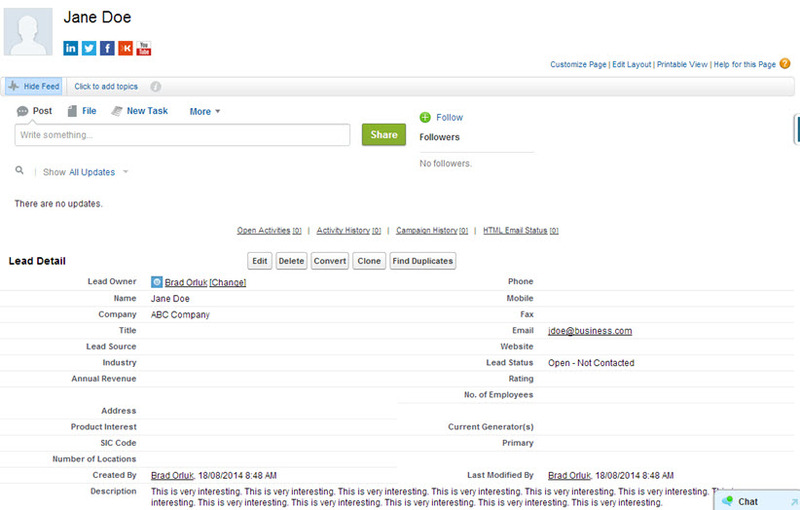 Now we can open the Salesforce create record action and begin configuring it. **Before we get into the fields and data to map, you’ll notice is that you will need to specify an email address of an authorizing user. This will allow the action to communicate with your SFDC instance. 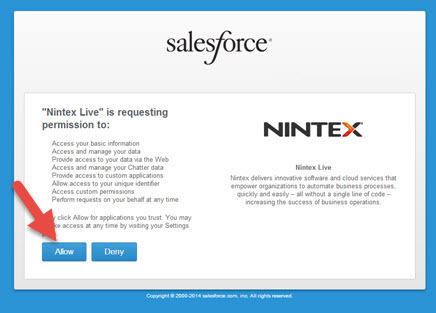 Be aware that this will send this user an email from Nintex Live requesting access to the SFDC tenant (in a similar way of how one would authorize a 3rd party app to access a Twitter or Facebook account) the first time you run the workflow. If the user has the appropriate permissions in SFDC (this should be your account in the developer environment) they can ahead and select allow the app to access SFDC as seen in the figures below. Lastly, we want to capture the ID and URL of the new SFDC record so that we can refer to it later, perhaps to access it directly or to integrate with via another workflow later. Now go ahead and save the action. Go ahead and save the action. Open the workflow settings, give your new workflow a name and then configure the workflow to start automatically when a new item is created. Now let’s run the workflow! Go ahead and create a new item on the list. Populate the fields and save it. The workflow will run and in a short amount of time you will have a new lead inside of your SFDC instance and the SharePoint item will have the SFDC record’s ID and URL added to it. That’s it! You’ve created your first workflow that integrates SharePoint Online with Salesforce.com thanks to the magic of Nintex! In the future I’ll work on visiting the other SFDC actions that can pull data and tie into the social aspects (Chatter) of the platform. I hope this post helps get you started on your journey of integrating SharePoint and SFDC. Feel free to let me know what you think and go ahead and share your experiences in the comments below!